Brand new, in factory taped bag, never opened.. I purchased one of these bags for myself. Shortly thereafter I received another one as a gift. I never opened the second one. I am now selling it here. Looks like a regular hiking backpack. It can fit a TON of gear. One small brand label. Not as obviously a camera bag than one that says LowePro or Tamrac in big "steal me" letters. 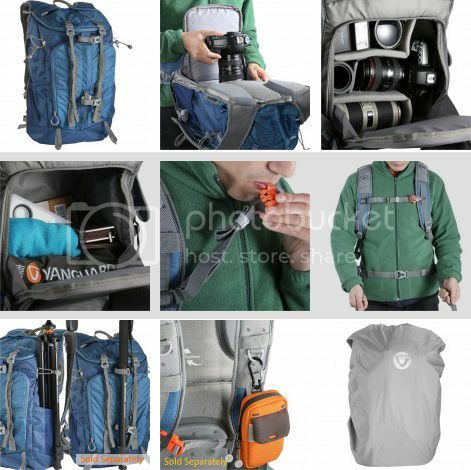 Padded camera compartment is big and well hidden, and highly customizable, unlike the side-opening camera backpacks of other brands. Comfortable carrying - 10 point adjustable harness with suspension system, well-padded, breathable back, sternum strap & waist belt. Shipping to the continental United States is free. For international shipping info, please PM me. is my preferred method of payment. It offers the same protections and convenience as PayPal but they charge sellers (me) far less in processing fees. is acceptable. I pay the processing fees. I have bought and sold many items successfully on the forum and ebay with the feedback to prove it. If you have any questions or requests, please ask. Returns accepted within 7 days of delivery if lens is not as described or if DOA. Last edited by geomez; 06-28-2017 at 11:38 PM.